Join us for the third installment of Spotlight Sessions! Mark your calendars NOW as Casey Noel hosts a fabulous line up of singer/songwriters for this Nashville style songwriter round. 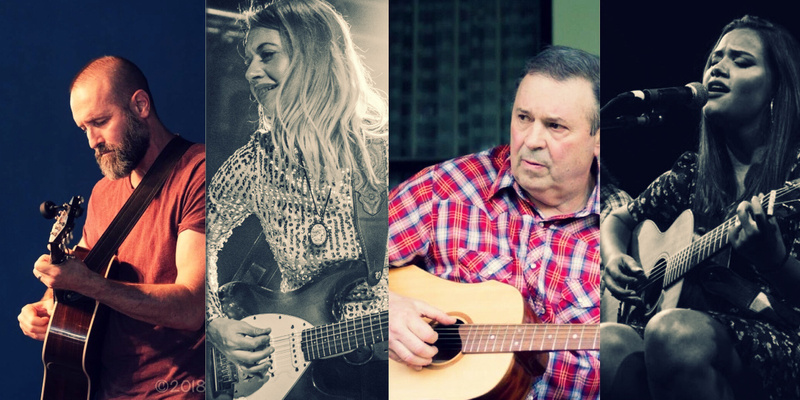 Join David Childers, Ashley Heath, Dave Ray Cecil and Casey Noel as they share their songs and the stories and inspiration behind them in a wonderfully intimate setting. Ashley Heath is an Americana, Blues, and Country Singer/ Songwriter hailing from Asheville, NC. Voted Best of WNC 2018 #1 Singer Songwriter and #2 Americana/ Country act by Mountain Xpress Readers, Heath has been rising on the music scene around the region with her velvety strong vocal, bluesy and raw guitar, and contemplative songwriting. Releasing two EP’s A Different Stream” in 2016 and “Where Hope Never Dies” in April 2018, Heath has been touring full time in the last three years playing as many shows as she can and has committed to connecting with as many people as possible through original music. Heath tours around the region in many forms from solo and as a full band fronting “Ashley Heath and Her Heathens” forming in May 2016. Within just two years of AH&HH forming, they have been placed on many festival markets and playing regionally. They also recently won the Merlefest Band Competition in May 2018 that takes place in Wilkesboro, NC and is one of the biggest Americana Festivals in the country. It has certainly been one of their biggest accomplishments yet! Heath had her first American National Tour in November 2017 touring from Asheville, NC all the way to Los Angeles, CA to promote first album “A Different Stream”. Now Heath embarked on her first European Tour playing eight shows in The Netherlands, Belgium, and France and playing shows in cities Steendam, Amsterdam, Haarlem, Ghent, and Strasbourg to promote newly released record “Where Hope Never Dies”. North Carolina — Singer-songwriter David Childers is the proverbial study in contradictions. A resident of Mount Holly, North Carolina, he’s a former high-school football player with the aw-shucks demeanor of a good ol’ Southern boy. But he’s also a well-read poet and painter who cites Chaucer and Kerouac as influences, fell in love with folk as a teen, listens to jazz and opera, and fed his family by practicing law before turning in his license to concentrate on his creative passions. The legal profession’s loss is certainly the music world’s gain. Childers’ new album, Run Skeleton Run, released May 5, 2017 on Ramseur Records, is filled with the kinds of songs that have made him a favorite of fans and fellow artists including neighbors the Avett Brothers. Scott Avett contributes to four tracks, and Avetts bassist Bob Crawford co-executive-produced the effort with label head Dolph Ramseur. (Crawford and Childers, both history buffs, have recorded and performed together in the Overmountain Men). Casey Noel is an emerging singer/songwriter in the NC Triad area. She is currently a senior at UNCG, and has been playing guitar since the age of five. Casey Noel brings a blend of folk, country, blues, and pop to her unique rasp and powerful sound. She possesses a pure vocal quality that is both distinct and mesmerizing. Though fairly new to the Triad music scene, she has become a crowd favorite at a variety of different venues throughout the Triad area. Her passion for singing and songwriting has her poised to make a big impact on the NC Triad music scene and beyond. Casey currently hosts Spotlight Sessions a singer/songwriter event that takes place every other month in The Crown at the Carolina Theater. If things go as planned , Casey hopes to release her first EP in the spring/summer of the new year.